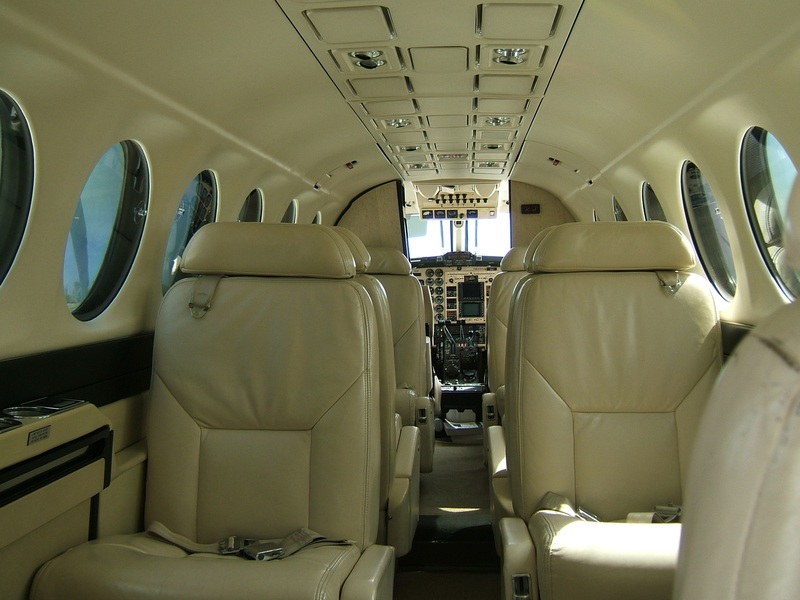 The Beechcraft Super King Air 350 is a commuter category part 23 certified twin turboprop capable of carrying 8 to 12 passengers comfortably. The aft portion of the cabin has an enclosed potty and a baggage area capable of handling 550 lbs of bags. It cruises at 310 kts and has a range of 1,700 nm. This capable twin has a max takeoff weight of 15,000 lbs which means that unlike the king air 200 a 350 captain must be type rated in the aircraft. With a nine passenger seat configuration you can carry nine passengers and a full load of fuel. At max takeoff weight, at sea level, on a 30o C day, with flaps up, bleed air open and air-conditioning on the takeoff distance is 5,015 ft. Under the same conditions with the flaps at approach the takeoff distance is 4,187 ft. Prop speed of 1768 indicates failure of the primary governor. Limit torque to 96% and flight may be continued. Auto feather must be operational for takeoff, climb, approach and landing. Ground idle low pitch stop – electrically actuated solenoid set at 10o below the flight idle pitch stop. The right squat switch de-powers the stop at lift off. If in flight the solenoid receives power for more than 10 seconds PROP GND SOL illuminates – pulling the PROP GOV TEST circuit breaker de-powers the solenoid – the light is inhibited on the ground by the left squat switch. Jet flap – vents P2.5 Air through a variable slot in each hollow strut that connects the accessory section to the compressor this produces a swirl effect for air entering the compressor, to improve low speed compressor characteristics. This entry was posted in King Air and tagged 300, 350 king air, airplane interior, beech 350, beechcraft, beechcraft super king air 350, general aviation, hawker beech craft, king air, king air 350, king air 350 interior, king air 350 limitations, king air 350 specs, king air 350 study guide, kingair, kingair 350, limitations, specifications, specs, super king air 350, turbo prop airplane on October 21, 2012 by James Sorsby. The falcon 50 is a 3 engine long range corporate jet built by the French company Dassault. The falcon 50 can carry 8 to 9 passengers comfortably and has an enclosed lavatory and a galley. It’s powered by three Garrett TFE731-3-1C engines capable of 3,700 lbs of thrust each. It has a maximum speed of Mach 0.86, cruises at 475 kts and has a range of 3,500 nm. 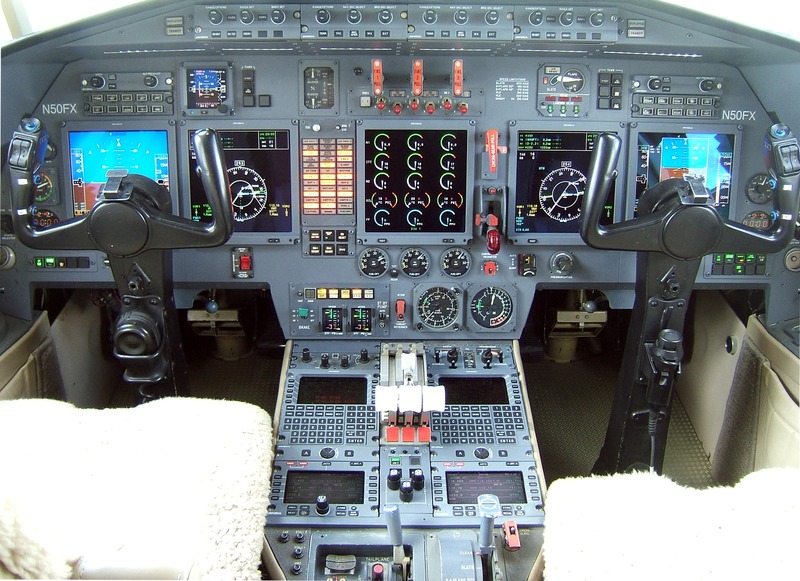 This aircraft has been retrofitted with a Universal Electronic Flight Instrument (EFI) 890 Primary Flight Display (PFD) and Navigation Display (ND) system. 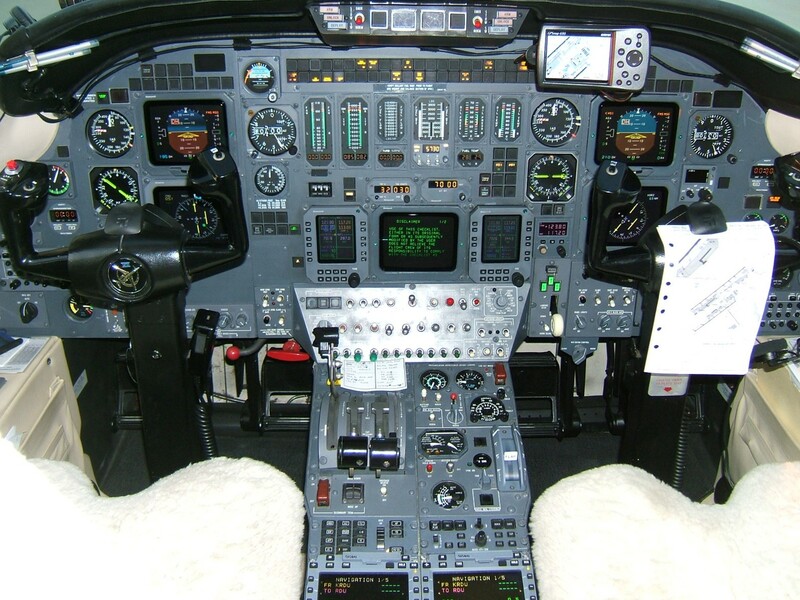 This entry was posted in Uncategorized and tagged cockpit, dassault, dassault falcon 50, dassault falcon 50 instrument panel, falcon 50, falcon 50 instrument panel, Garrett tfe731-3-1c, instrument panel, universal 890, universal efi 890 on October 21, 2012 by James Sorsby. The instrument panel of a Cessna Citation VII. Cessna built 119 of the VII’s which were based on the popular Citation III business jet. It’s powered by two Garrett TFE731-4R engines that can produce 4,080 lbs of thrust each. it has a range of 2,000 nm and can cruise at Mach .85 and has a service ceiling of 51,000 ft. 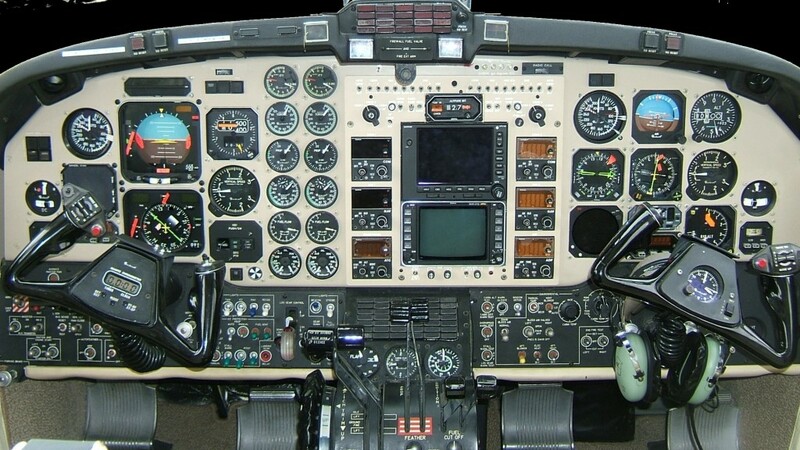 This entry was posted in Cessna Citation and tagged c650, cessna, cessna citation, cessna citation cockpit, cessna citation vii, cessna citation vii instrument panel, citation 650, citation 7, cockpit, instrument panel on October 19, 2012 by James Sorsby. The Cessna Citation VII, the last of the Citation 650’s, is an upgraded Citation III powered by two Garrett TFE731-4r-2s turbofan engines capable of producing 4,080 lbs of thrust. It has a maximum cruise speed of 480 knots, a range of 2,000 nm and a 51,000 ft service ceiling. The VII was Cessna’s corporate jet that it marketed against the Lear Jet lineup of high speed private jets. The 7 is capable of .85 Mach or 85% the speed of sound. Cessna surpassed this when they built the Citation X which is capable of mach .92. 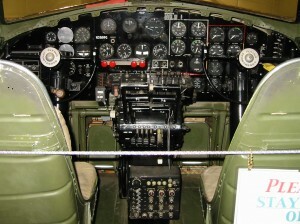 A total of 119 VII’s were built. 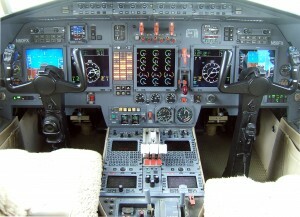 This entry was posted in Cessna Citation and tagged aviation aircraft, aviation photo, c650, ce650, cesna citation 650 cockpit, cessna citation, cessna citation 650, cessna citation vii, citaion vii, cockpit, general aviation, instrument panel, private jet, tfe731 on October 19, 2012 by James Sorsby. 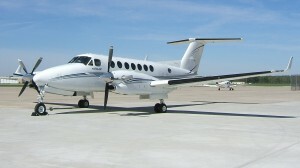 The Beechcraft Super King Air 350 is a large twin engine turboprop capable of comfortably carrying 8 to 12 passengers. Two Pratt and Whitney PT6A-60A 1,050 shp turbo prop engines give this popular corporate aircraft has the ability to operate out of short runways with heavy loads and fly 1700 nm at 310 kts. 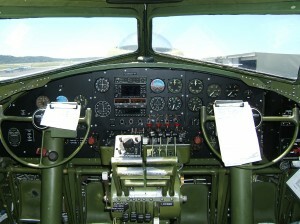 The panel is from an early serial number aircraft with analog flight instruments and a Garmin 500 installed. For more info, specs and limitations on the KA 350. This entry was posted in King Air and tagged beechcraft, beechraft super king air 350, cockpit, king air, king air 350, king air 350 instrument panel, king air instrument panel, turboprop on October 17, 2012 by James Sorsby.